I love all things seafood. Maybe it’s my upbringing in the landlocked Midwest and therefore lack of fresh seafood or that I was fed pureed sushi as a baby, or maybe its just my appreciation for it from a culinary standpoint. Whatever it is, you will see a few more Paula Peck seafood recipes on here soon. I had to modify this one quite a bit from the original in “The Art of Good Cooking.” The flour liquid proportions were pretty far off and had to be corrected. I also prefer to use a beer batter for both texture and flavor. 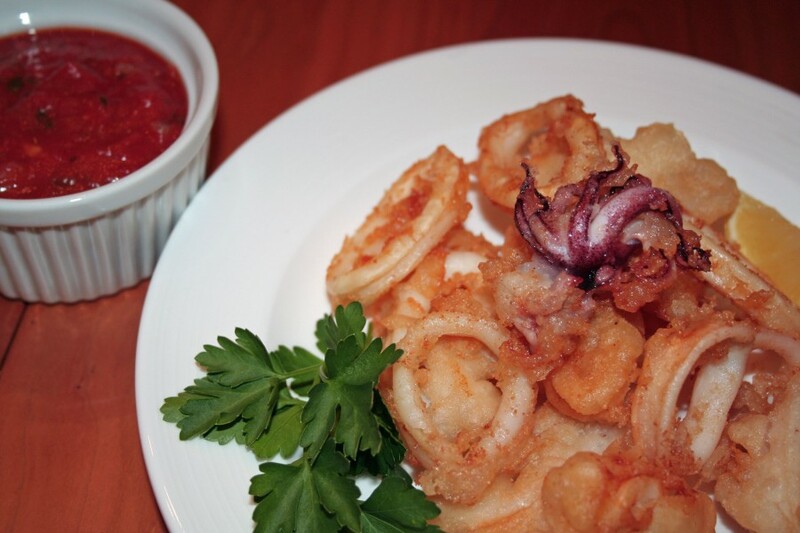 This is not the breaded style fried calamari often served as bar food, but more of a tempura style. Though perfectly delicious on it’s own with a squeeze of lemon as noted in the original recipe, I like to take it a step further with a couple different dipping sauces: a simple marinara and a lemon aioli. The aioli is my favorite. I’ll eat it with just about anything fried, especially french fries. You can buy mayo and add lemon and garlic to make the aioli, but I really think it tastes much better homemade. This lemony garlicky sauce is the perfect complement to any seafood, especially this crunchy yet soft calamari. So enjoy this favorite bar food with an ice cold glass of beer at your next casual get together. Cheers! Clean squid by washing under running water, rubbing off any outer speckled skin and pulling out all entrails. The fish will then be shaped liked tubes. Cut tubes into 1/4 inch slices. In a deep pan, heat 2-3 inches of oil to 375 degrees. Sift flour, baking powder, and salt together. Whisk in beer. 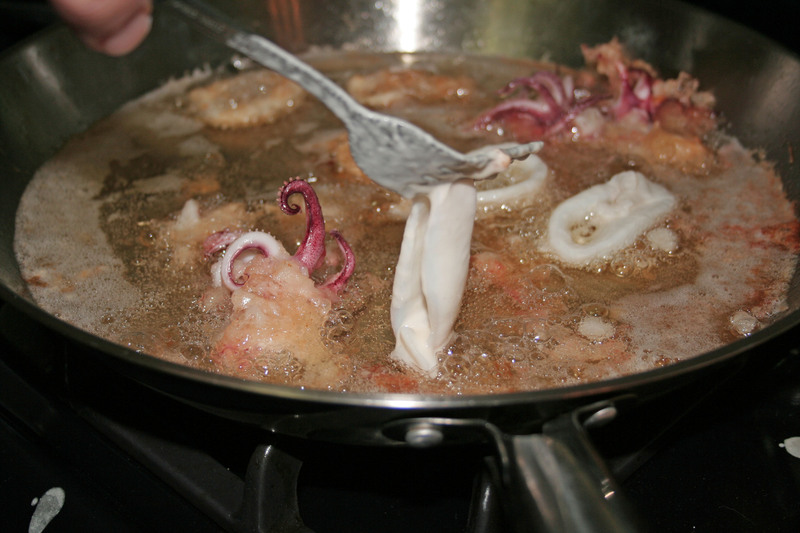 With a fork, dip slices of squid into batter and drop in oil. Fry until golden brown. Serve at once with lemon wedges. Heat a small sauce pan over medium heat. Add olive oil. When hot, add garlic and onion. Saute for 1 minute. Add crushed red pepper. Saute for 1 more minute. Add crushed tomatoes and bring to a boil. Remove from heat and season with salt and pepper to taste. Combine egg yolk, mustard, salt, and vinegar in a bowl or blender. Whisk or blend for 10-20 seconds. Begin adding oil drop by drop while whisking or blending until emulsified. Add the rest of oil in a steady stream. Once the mayonnaise is formed, add garlic and lemon juice.